Hello, MMGM! Long time no see. But my kids have been hounding me to read along with them more, so I expect I will be peeking back in more often. Of course I can’t resist reviewing a James Riley book, and that is what would bring me back into the fold. 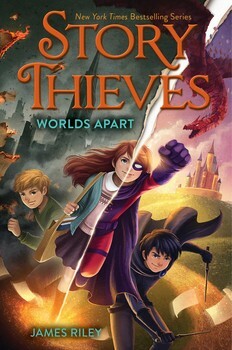 I held off on reading the fourth book (PICK THE PLOT) in the STORY THIEVES series, mainly because I wasn’t super-excited about it being a choose-your-own adventure story. I don’t know why. I loved those books when I was a kid, and I know what a genius James Riley is at turning any preconceived ideas you may have on their head. And it was totally awesome, just like the rest of the series. But I’m still glad I waited until the paperback of PICK THE PLOT came out because it ended on a total cliffhanger, and then I didn’t have to wait to read the series finale, WORLDS APART. Side note: I was in the middle of another book when it arrived, and my ten-year-old beat me to it, so he kept telling me how awesome it was. Then, once I started reading, he needed constant updates about where I was in the story. I love how we can enjoy stories together! Fair warning before you read this review, it includes SPOILERS for the earlier books. If you haven’t read them yet, you should stop before the description. Or just click over to my review for the original STORY THIEVES and start there. 1. The pacing – I read this book in two days. In fact, I was so into it, I stayed up really late to finish it, and then when I got ready to write this review, I was like, “Wait, did that really happen at the end?” Turns out I was so sleepy I missed a few things. But that just meant I got to read it again :). James Riley accomplished this fantastic pacing using the same technique he implemented in ONCE UPON THE END. For most of the book, Owen and Bethany were separated, and the chapters switched between their points of view, leaving the reader on a cliffhanger at the end of each chapter. It made it very hard to stop reading. 2. All the characters – It was the perfect reunion of my favorite characters. Okay, there was one particular character I really would have loved to see again (mentioned in my STOLEN CHAPTERS review), but I can see how she wouldn’t fit here. I don’t want to give away who all does return, except that of course Kiel is included. I mean, he’s on the cover :). 3. The conflict – I can’t even explain exactly what Nobody has done if you haven’t read the book. They’re not trying to save THE world; they’re trying to save multiple worlds. It’s so meta James Riley pokes fun at it in the acknowledgements (one of the funniest parts of the books, actually). 4. Bethany’s character arc – Well, actually, I guess it’s two character arcs since there are two Bethanys? I sort of hated both Bethanys. My son and I had a rather heated discussion about this because he liked one of them. But I think the whole point of splitting Bethany was that she wasn’t meant to be two halves of herself, and I thought it was interesting that James Riley approached it with each half thinking they were better off alone (a plot point you discover in the first chapters). 5. The ending – Well, like I said, I had to read it twice to make sure it really happened the way I thought it did. This ending was completely crazy and yet satisfying. I’m still reeling a bit from one particular plot point that I can’t believe he left that way, but hey, it’s fiction. If you really are just telling Owen and Bethany’s story, Mr. Riley, my son would love to go hang out with them sometime. I’ll keep their location secret :). I can’t wait to see what James Riley writes next. We’re all fans in this house! Glad we’ll see you around more. Miss you. And that’s great that your son beat you to this one and enjoys this series too. He’s constantly searching my bookshelves for new things to read. I keep steering him away from the YA, so I need to stock more MG! So great you get to share reading experiences with your son. I have loved this series but the last book is still waiting for the time to read. Your review has pushed it to the top of my pile. And welcome back! You can beat a crazy, but satisfying end! I’m a huge James Riley fan as well, and I agree with your thoughts on this book myself. Great end to another great series. I can’t wait for his new series! I had more fun reading how you shared the reading experience with your son. I bought the first book to review, but gave it as a gift to a middle grader who expressed an interest in it. I am not a fan of pick your plot, but I should have given this book a chance — especially after reading wonderful your review! Nice to see parents and kids reading together. That’s such a great thing to do. Thanks for your overview of this book. I’m not familiar with the series. OH MY GOSH I NEED TO READ THIS!!! I’ve been a fan of this series for forever and I can’t believe I haven’t read this yet!! I’m glad it lives up to its expectations. Now, off to read! Ahh! You will love it so much!